For a while I was having problems with my laptop having too little memory. It was a Dell XPS13 developer edition. A system I was very happy with, but the 8GB RAM was proving to be too little in some cases. So I wanted something more powerful. I chose the Dell M3800 because it has a recent i7, has 16GB RAM and a HiDpi screen with a 3200×1800 resolution. No “developer edition” though but (being a full-time Ubuntu Linux user) I went bought it anyway. I installed Ubuntu 14.10 on it. and encountered a few issues. The system was a bit slower to compile than my previous one even though it has more memory and a faster processor. Looking into this, it seems this was caused by overly aggressive settings to keep the temperature down. I tweaked the termald settings to kick in at 75 instead of 45 degrees and this halved the compile time! For details look at “Thermal Issues” and “Powerclamp”. Parcellite (a tool which keeps clipboard memory) does not seem to work. I replaced this with diodon which seems to be a better tool anyway. The system needs to be rebooted a lot more than my previous one. There are two problems which sometimes occur which need a reboot to fix. One is that the screen turns black – as if I am not doing anything except it kicks in after a second or two instead of five minutes. I turns back on when I move the mouse but gets annoying quickly. The other is that the wifi sometimes gets very disfunctinal, hardly being able to connect to the local network and when it does only has very limited bandwidth. Sometimes the keyboard becomes quite unresponsive. This may be application related. I have encountered this most in pgAdmin and Inkscape. Inkscape also seems to crash very easily. The HiDpi screen is a challenge in itself. Ubuntu itself (or Unity) looks great. The trick is to set the “Scale for menu and title bars” setting in the display menu. I used “2” as setting so the screen looks as if I have a resolution of 1600×900 but with more detailed rendering. Firefox also works fine. You just have to set “layout.css.devPixelsPerPx” to 2 in about:config. The same trick works for thunderbird. To access about:config, go to Edit → Preferences → Advanced → Config editor. Chromium only half works. Many windows and pop-up boxes are positioned and scaled wrong. Unfortunately many application don’t (or only half) support the scale setting. For example pgAdminIII is mostly ok, but all rows in query results are only half the size of the text displayed in them. Java applications also don’t respect the scale. In some cases this can be fixed by configuring the text size (for example in IntelliJ IDEA), but the menus and icons stay too small. For the many, installing jayatana (Unity global menu integration) really helps. In short, the linux support for HiDpi displays is clearly a work in progress. Maven builds often take some time. This often causes me to start doing something else (read mail, browse web), which makes me unaware of when the build completes and I can continue working. There should be a way to fix this. On Ubuntu, you get notifications when mail arrives, when network is up/down etc. Why not use this same system to get notifications when the maven build completes. 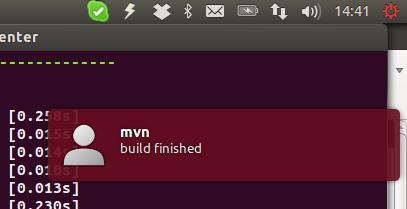 maven $* ; notify-send --icon=message-im "mvn" "build finished"
Thanks to Adrien, you can also use a more advanced version, showing the build result and maven parameters. notify-send --icon=face-crying "`basename $(pwd)`: mvn $*" "Build FAILED"